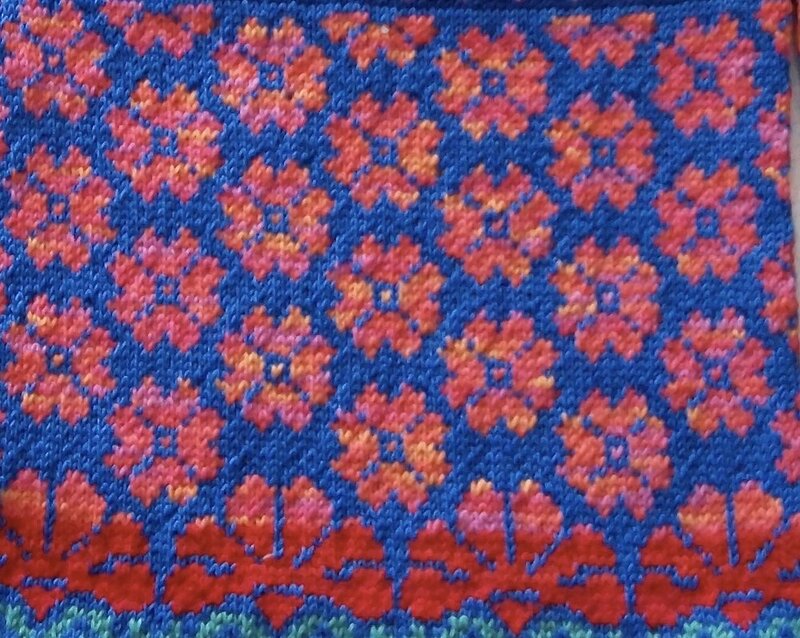 A very flower-ful sweater, very inspired by the Sweaters books by Takle and Kolstad. The main body is variegated red flowers on periwinkle. The bodice is variegated blue poppies on red. The sleeves have the main body pattern. The neck, wrists and hem trim is red petals on dark blue. 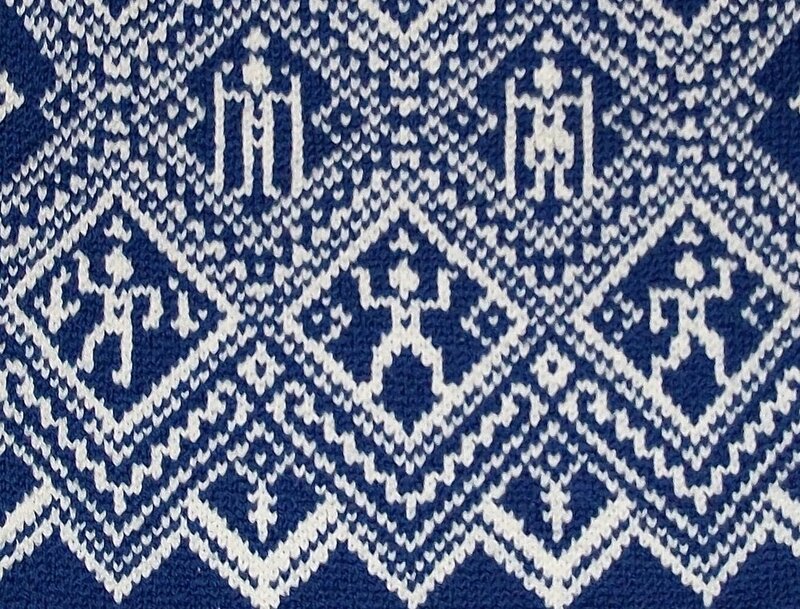 This dark blue and white pattern shows various Norse Gods within a traditional design. When I designed it, I had specific Gods in mind for each inset, but the only one I can recall is Skade with the skis, and another male skier. Is that Thor with the hammer on the left? And probably Odin in the center and Loki on the right. This is where D'Aulaires' Norse Myths is needed. The hem pattern spells Thor Odin Balder Loki in variegated blue on red, from a lettering pattern in Here Be Wyverns. The sleeves spell Norse Myths at the top. The neck, wrists, and hem trim is red stars on dark blue. This is a original version of the Dancer sweater, named after its recipient, our cousin Saskia. At this age she loved dance but she has since gone on to express herself beautifully with abstract paintings in various media. Of course the main colors are periwinkle and white! Three dancers are surrounded by swirls. The sleeves have swirls and crosses. The wrists and hem have a dancers pattern, with various girls in different colored dresses against a land and sky background. The neck, wrists, and hem have picot trim in alternating stripes of dark blue and variegated blue. There is a small placket at the neck with two pewter clasps.